Adam is the Digital Workflow Team Leader at Ngā Taonga. Currently that mostly involves making archival digital copies from a whole range of videotape formats – a task where his expertise can really shine. Think of a videotape. You’re probably seeing a VHS cassette, the dominant home-video format. The idea is the same across a whole bunch of different formats: information is stored in a magnetic layer on a polyester strip which runs over electromagnetic heads that decode the audiovisual content. VHS became the consumer default, but for professionals there were many other formats. There’s 1-inch and the earlier 2-inch ‘quad’ tape, both open reel-to-reel formats. There’s U-matic, the first to come in an enclosed cassette. There’s the Beta range – Betamax, Betacam SP. 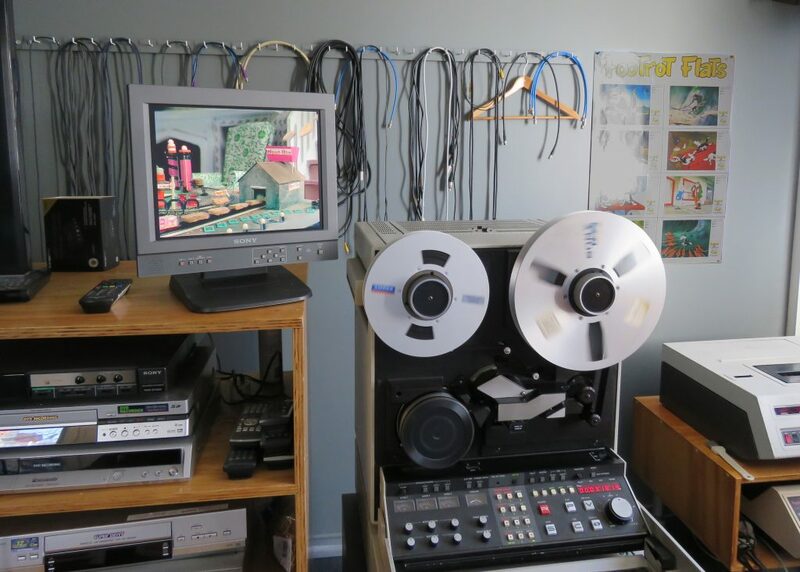 Hard-to-finds like the Sanyo V-cord and more modern tape formats like Hi8 and Digital Video DV, Betacam IMX, Digital Betacam and HDCAM tapes. Each of these became popular before being replaced by more modern technology. The AMPEX VPR-80 – a 1-inch tape player. Trying to keep up with all these ageing machines and the particular issues they present is a huge archival challenge. 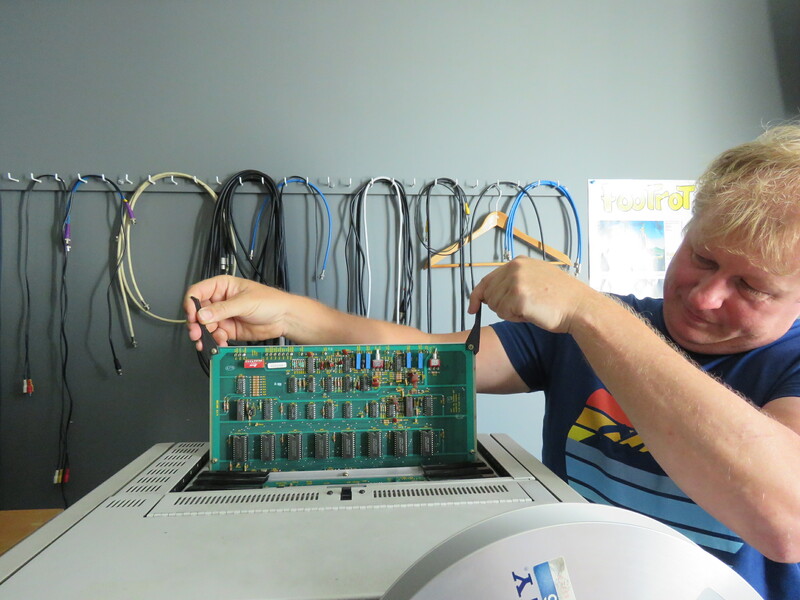 Ngā Taonga is incredibly fortunate to have the services of Tim Jenkins – a service technician from Avalon Studios. One day a week he helps to ensure the spools can still turn and the tapes can be read. “Tim’s spent his whole career working on these machines – he knows all their foibles. Each deck also requires specialist servicing tools to make sure that the parts are properly positioned within the housing. There are tension guides and special jigs and springs that ensure the tape loads correctly.” It’s a daunting task that requires extensive specialist knowledge. I flick through the AMPEX manual. It is enormous and looks like the plans for a spaceship. 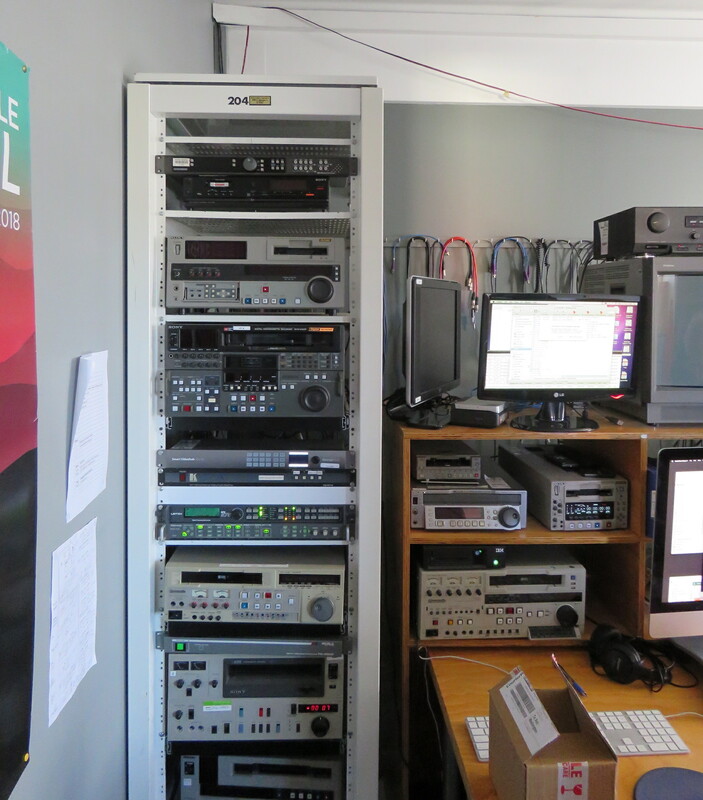 Even with these manuals, there is a big vulnerability: “Broadcasters no longer have 1-inch players or Betacam decks that need to be fixed: this expertise is only needed by archives. It’s a small market. No one is being trained to replace the brain pool and now there are very few technicians for these machines in the Wellington region”. Adam Sondej and the AMPEX VPR-80 manual. The 1-inch player in the Wellington office has recently been serviced and is up and running after being out of action for a year. Adam turns it on. He gets a test tape reel from a case and threads it through the spools. “Even though it’s been repaired, this machine doesn’t like hot temperatures and the motors can stop after half an hour. It’s not an exact science – you get a feel for how different machines work. 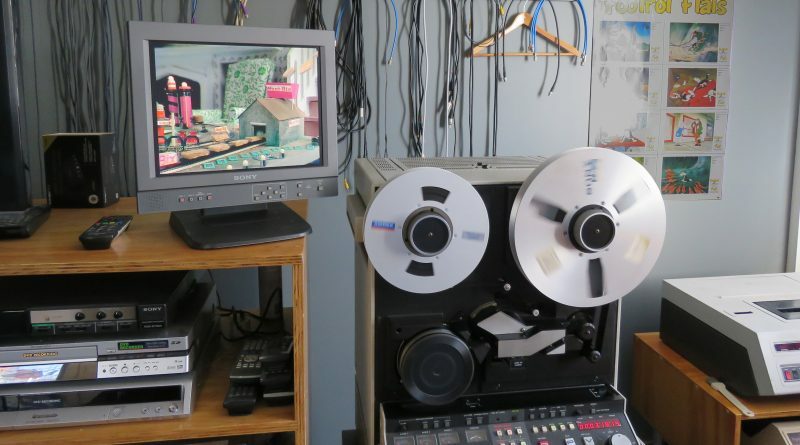 ” The tape gets wrapped around the drum and glides past separate audio and video heads. There’s a low whirr as the reels get up to speed. The screen flickers and an image appears of a Weetbix commercial. The quality is really good! The colours are vibrant and the movement on screen is smooth. I’m impressed, though this is how it should be ideally – a well-preserved tape on a well-serviced machine producing an image that looks as good as the day it was created. Adam and the delicate circuitry inside the AMPEX. Adam pauses the commercial and the action sits motionless. While he can claim that it’s not an exact science, he does know the science involved too. His eyes light up as he tells me that “video works like this: photons of light get focused through a camera lens onto a sensor that is coated in gallium metal. It’s a beautiful crystalline metal that reacts to light and creates electricity. That light-reactive coating creates a voltage and that is what can be turned into a magnetic field, which is then carefully laid out onto tape and can later be reconverted to a voltage by a magnetic sensor and put on to a monitor to display. It’s technology verging on magic”. This magic captures television. Much of the Television New Zealand collection is on Betacam tapes – extensive news programmes, television ads, iconic Kiwi music videos, Shortland Street, Country Calendar, Radio with Pictures, It’s in the Bag, Kaleidoscope,What Now, Spot On, Te Karere, Waka Huia, Marae, Tagata Pasifika, This is Your Life, Mastermind, Wheel of Fortune, Close to Home, and Outrageous Fortune, not to mention Commonwealth and Olympic Games, America’s Cup and Rugby World Cup coverage. 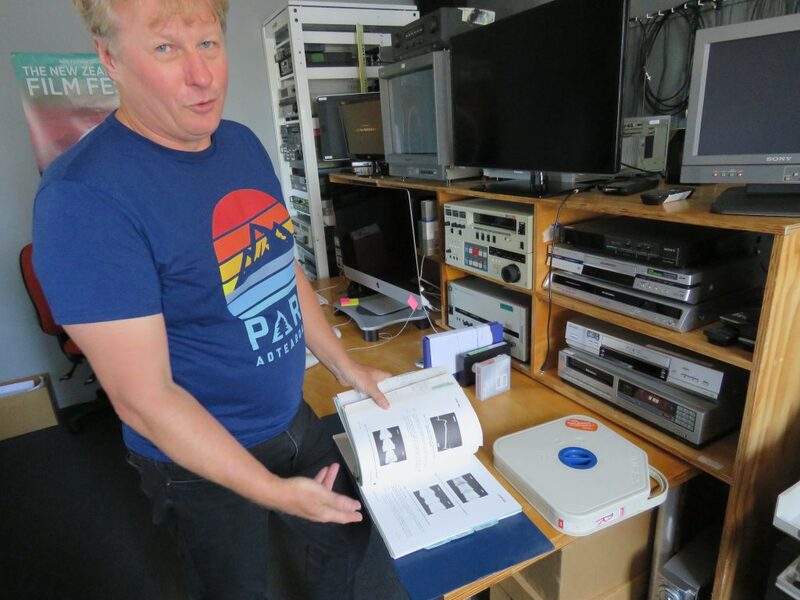 An enormous amount of the country’s audiovisual taonga is held on a series of increasingly obsolete tape formats with old machines struggling to play them. Videotape was not designed to be an archival medium. “Essentially videotape is a coating of rust glued onto a plastic ribbon – not the most stable combination!” But storing tapes in the Archive’s climate-controlled vaults greatly prolongs their life. A rack of decks and servers for video capture. Ngā Taonga is not alone in working through these problems. “Worldwide it’s estimated that only about a quarter of professionally recorded magnetic tape has the potential to be transferred to an archival digital format. There’s a lack of machines and simply not enough hours remaining in the video reading heads to digitise it all,” Adam explains. “Ironically, there are more than a dozen types of brand new film scanners available, all with maintenance support. It’s this newer medium of videotape that’s sort of been left behind.” With a piece of film, you can even just hold it to the light and see the images. Unless you have the correct equipment to decode the image, magnetic video tape is a blank, black mystery – a downside to space age technology. For now, a huge amount of material from the 1970s to the early 2000s is largely on videotape and increasingly inaccessible. What is the way forward? Could it be possible that we have a videotape renaissance? We watch through to the end of the commercial. It’s a relic of the recent past that has been well cared for. Adam stops the tape and rewinds it. The tape zips back through the reels and he puts it back in its case. This tape has been digitally preserved, but there are plenty of others yet to be saved. Bulk digitisation or new machinery are a couple of ways that could help with this in the future. For now, people like Adam, Tim Jenkins and the Ngā Taonga videotape preservation team helps to ensure we can still access the video age.